Please note: Our Nature Van Program is completely booked for the 2018/2019 school year. If you would like to be added to the waitlist, please fill out the Nature Van request form below. In the comments and question field please indicate days of the week and month(s) that you would be interested in booking. If a date becomes available, we will contact you. We will begin accepting bookings for the 2019/2020 school year in the first few weeks of May, 2019.
spacer Scholarships available! Complete the information below to apply. Have you ever touched a skunk's fur or felt a rattlesnake's scales? This interactive presentation provides students with the opportunity to be hands-on with animals they wouldn’t otherwise be able to experience up close, leaving them with a strengthened sense of responsibility toward preserving our planet. Let our local wildlife teach you simple ways to help preserve our planet. Investigate the issues affecting wildlife and learn simple ways that you can make a difference. It's easy being green? Your school may be eligible for a WildCare Scholarship! Click here for more information on our scholarship program. Question - Not Required - Approximately how many students will participate in this Nature Van Program? 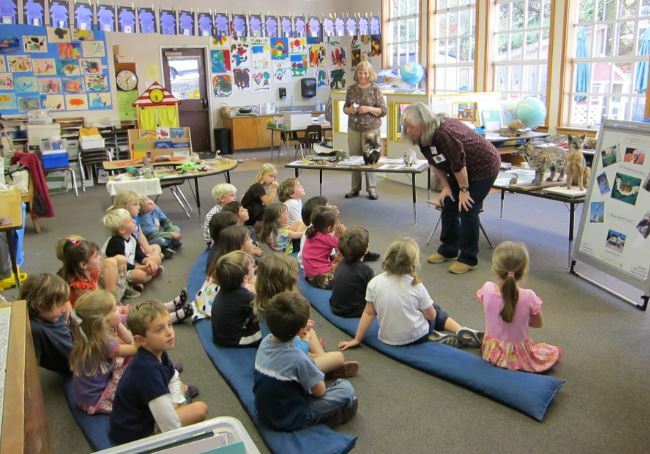 Nature Van programs are designed to be presented in 60 minutes (45 minutes for Preschool and K) time slots to a class of 25 students (30 person maximum, including adults). This includes 5-10 minutes for students to get a closer look and touch the taxidermy animals and bio-facts we bring at the end of each presentation. Since you know your schedules best, we ask that you create a schedule that works for your class(es). Please allow a half hour minimum for setting up the taxidermy and bio-facts in the designated room, a minimum 5-10 minute (maximum 20 minute) break for the presenter between presentations (if there are multiple presentations in one day), and a half hour minimum/one hour maximum break for lunch (if applicable). Do you need to apply for a scholarship for your Nature Van Program? If you are able to accept a smaller scholarship it would be greatly appreciated, as this will enable us to reach even more students in the Bay Area. Question - Not Required - What amount can you afford to contribute? Question - Not Required - Please share how receiving this scholarship would benefit your students' educational experience?